Here is another support spindler on the move. Note the larger spindle and support stick than we saw last time. The larger tools are probably because she would be spinning sheep's wool rather than cashmere. 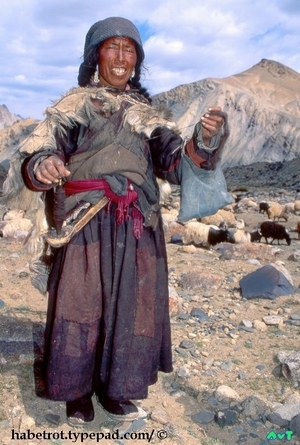 As with the spindler in my prior entry, she is from northern India, this time from the Ladakh region on the Tibet border. But whereas the woman in the last entry was fairly citified, this spindler is a working shepherdess. You can see her sheep* in the background, grazing on next to nothing. Her dress has been patched and re-patched. She wears a sheepskin around her shoulders, and her hat is knitted. It looks to me like the red sash is silk. You can see that she wears several layers of clothing. See the blue bag on her left forearm? That's her version of a wrist distaff--it holds her fiber supply, which looks to be prepared rovings. *I can hear some of you crying out, "But what kind of sheep are they?" 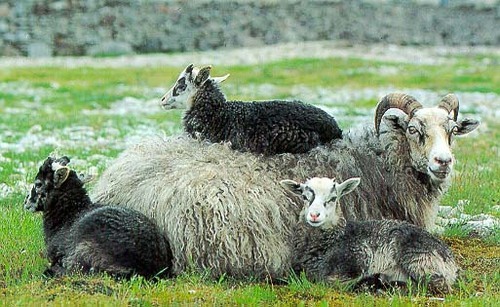 The best answer I can give you is Indian sheep. 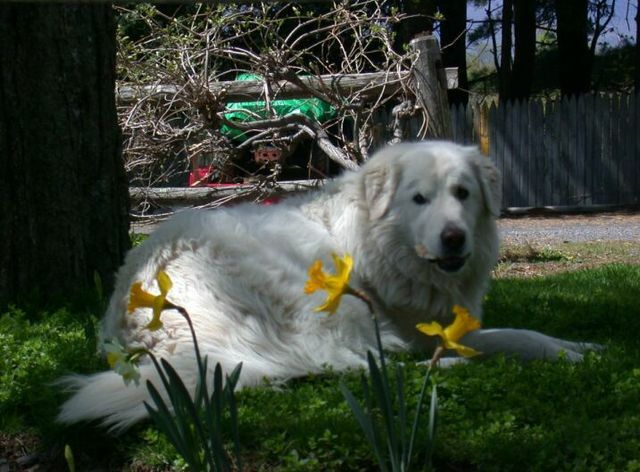 In the strict sense, there are no specific breeds, since the majority of them do not have specified defined characters. Neither are there breeding societies or agencies to register animals of particular breeds, maintain flock books and ensure the purity of the breed. 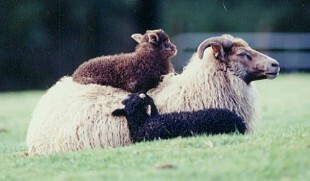 A population of sheep or goats in a given locality, with characters distinct from other populations in the vicinity and with a distinct local name, has usually been considered as a breed. 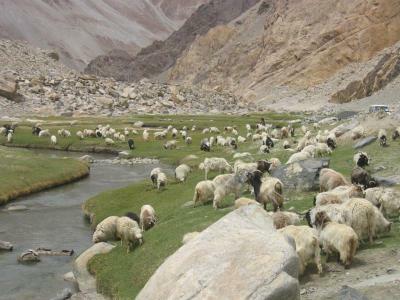 Most of the breeds of sheep and goats are very well adapted to the harsh climate, long migration, and lack of vegetation and drinking water. 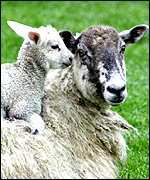 A large proportion of sheep and goats (more particularly the latter) are of nondescript or mixed breeds. "She says you need brains to do this." These images are screen captures (sorry for the poor quality) from a video of a spindler in Himachal Pradesh, a state in northernmost India. The extraordinary thing about this lady's spindling is that she is using a support spindle while on the move, something I have never seen before. She is supporting the spindle on a stick with a carved cup on one end and a knob on the other, and the stick is thrust through the cloth tied at her waist. 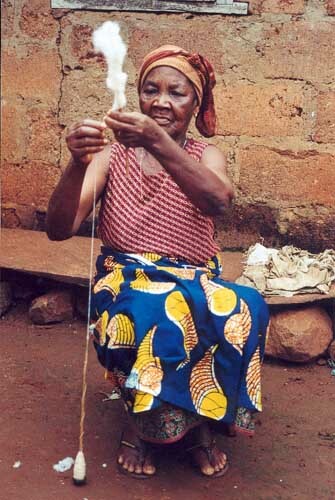 As with the Togolese spindler in the previous entry, this spindler is using a support spindle for spinning fiber with a very short staple length. But rather than spinning cotton, I believe she must be spinning cashmere or similar goat down fiber. To see the full video on YouTube, go here. My thanks go out to Julia and The Boy of Moth Heaven for finding this video and sending it to me. Cotton spinning in Agou, a region of the African nation of Togo. Inasmuch as the national language of Togo is French, this lady would more properly be described as une fileuse de coton à Agou. She is spinning with a support spindle rather than a drop spindle. Since the spindle is supported, there is no weight on the fiber being spun, enabling her to work with very short fibers and to produce a very fine yarn. What could possibly be more comfortable? 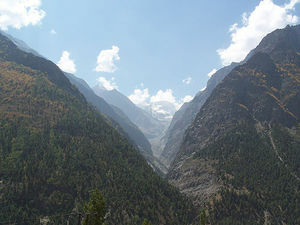 Where would you rather hang out? There's a New Breed. 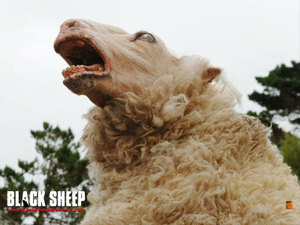 . .
"Black Sheep" will be in US theaters on June 22. Go see it if you dare. Me, I'll be taking a pack of these with me for protection. 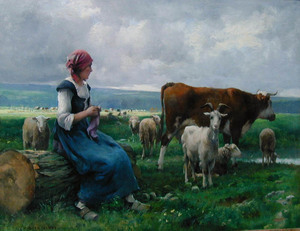 This is "Shepherdess With Goat, Sheep, and Cow" by Julien Dupré (1851 - 1910), a French realist painter. Dupré is a favorite of mine. You will be seeing his works in these pages again.